Steve's Meat Shop (SMS) food concession is family owned and operated by the Fowler Family. This veteran owned business was established in 1980. SMS is a USDA licensed manufacturer that makes all of its unique products. These products are prepared and sold at SMS Mobile units throughout the country at large events such as State and County Fairs and Festivals. SMS equipment is immaculately clean, modern and well maintained. SMS staff is friendly and focused on quality service and take great pride in having satisfied customers. As a result, a high percentage of our business is from repeat customers and referrals. We welcome the opportunity to earn your trust and deliver you the best service in the industry. Family Business, Veteran Owned and Operated. All meat cut fresh for events. Check Out This Video of Steve's at the Saint Charles Oktoberfest courtesy of @EnjoyKraftig. We look forward to serving at an event near you! To provide a safe and friendly presence serving high quality meats in a professional manner. 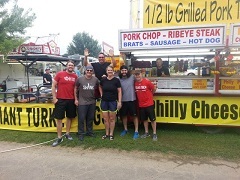 Jerrod Niemann was set to perform at the 2016 DuBuque County Fair this year and came with his crew during the day to grab a bite from Steve's! 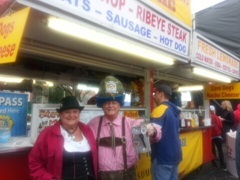 Mr. and Mrs. Oktoberfest at the Soulard Oktoberfest in 2014. Mike sure has dedication to his job!